“BELIEVE the hype” was the message from Tynecastle last night as Hearts moved clear at the top of the league with a comfortable victory over Motherwell. For the first time since George Burley’s short but memorable spell as manager, Hearts have started a top-flight season with three consecutive league victories. Perhaps there is not the same sense that a genuine title challenge is being mounted as in 2005-06. But little was going to diminish the joy of those Hearts fans relishing this 100 per cent start at a sold-out Tynecastle. A goal in each half – from Gavin Reilly, his first for the club, and Billy King – made it a hat-trick of league victories for Robbie Neilson’s new-look team. With games to come against Ross County and Partick Thistle, who is to say they cannot extend their stay at the top, with the lead now an outright one after Kilmarnock’s late equaliser against Celtic. News of that result was cheered to the rafters by the already delirious Hearts fans, whose team coped very easily with whatever pressure comes with being league leaders so early in the season. 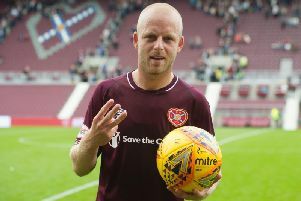 Hearts were even able to rest Juanma, the popular striker whose two goals in the comeback against Dundee on Saturday earned one of their three league wins to date. He emerged in the second half and Hearts secured the win a few minutes later, courtesy of King’s strike. But while Juanma can well claim some credit for giving the players and home fans a noticeable boost with his very appearance, it was the hard-working Reilly who caught the eye in his canary-coloured boots. As far as the 22-year-old was concerned, it was an especially profitable evening as he stepped up to the challenge of replacing Juanma, both as central striker and also penalty taker. He was handed the perfect opportunity to get off the mark from the spot after 32 minutes, following Scott McDonald’s particularly injudicious challenge on Sam Nicholson as the Hearts man advanced into box. McDonald slid in from behind and tripped Nicholson. When Brian Colvin pointed to the spot, McDonald, it was plain to see, reserved his disgust for himself, for he knew he’d erred. Reilly was handed the ball by Nicholson, with his teammates as seemingly keen as the former Queen of the South striker himself to see him score his first goal. This he did with admirable aplomb, sending the Motherwell goalkeeper Connor Ripley the wrong way before celebrating with those sitting in the bottom corner of the Roseburn stand. Like Juanma on Saturday, he had efficiently completed his duties and looked to build on such a confidence-boosting moment. But it was Motherwell who almost equalised immediately. They charged up the other end of the park straight from the re-start, with Marvin Johnson eventually taking the shot on goal that was well gathered by Neil Alexander. It was an odd first half in that while Hearts had plenty of the possession, clear-cut chances were at a premium. Indeed, Motherwell could well have opened the scoring after Prince Buaben was robbed by Louis Moult, whose eventual shot was weak after some initial good work. Buaben should have put Hearts further ahead seven minutes before the interval but his header from Nicholson’s header skipped just wide. Perhaps reflecting on what they themselves had done to Dundee on Saturday, Hearts knew there was still much to do if they were to make sure of the victory as they emerged for the second-half. Neilson was concerned enough to send on Juanma just before the hour mark, the Spaniard replacing the ineffectual Osman Sow. His introduction gave Hearts and their supporters an immediate lift. King rasped an effort that was deflected past the post and from the corner, Igor Rossi’s header was cleared off the line by Louis Laing. Shortly afterwards, Hearts scored what proved to be the decisive goal, helped a little by poor goalkeeping from Ripley. King drilled in a low shot from the edge of the box which seemed to go through the clutches of the Motherwell goalkeeper before bouncing up into the roof of the net, with visiting defender left Steven Hammell beating the turf in frustration. He seemed to accept the game was done. Unlike in the Dundee derby the previous evening, there was little prospect of a two-goal comeback from Motherwell, who failed to muster even so much as a consolation goal when substitute David Clarkson’s shot on the turn from the edge of the box dipped just over the bar in the dying minutes. Motherwell: Ripley; Law, Laing, McManus, Hammell; Ainsworth, Lasley (Leitch 68), Taylor, Johnson, McDonald (Clarkson 85), Moult (Thomas 76). Unused subs: Twardzik, Chalmers, Kennedy, Cadden.